I admit that I am a bit of a caramel, cooked sugar, freak and it is not uncommon that I play with it for fun or to enhance a dessert. I am particularly fond of salted butter caramel anything and I was in heaven when we visited Normandy and Brittany because caramels are everywhere (region's specialty) Unfortunately, B. and I are out...we finished the last one a couple of weeks ago and we are starting to show some signs of "salted butter caramels deprivation"...and it got me thinking that there must be a tried and true recipe out there that I can cook up to save us. I started searching familiar cooking sites and pondered on this one from Epicurious, but the 70/30 rate of success and disaster made me discard it (and there were some pretty awful reviews)... After some more research I found myself on Guillemette's blog again, staring at these several times a day. Melt the chocolate in the microwave or over hot water bath and set aside. Heat the cream to lukewarm in the microwave also, and set aside. In a heavy saucepan, set over medium heat, combine the water and corn syrup. Add the sugar and let it caramelize until it reaches a light golden brown. Remove from the heat and slowly add the cream to the caramel. It will bubble like made but do not worry...it will not bubble over and things come down eventually. Return the pan to the heat and add the butter and the salt. Let the mixture cook until a thermometer registers 118 C ( about 245 F). Remove from the heat, add the chocolate and stir until completely smooth. Pour into a parchment lined 8X8 inch baking dish. Let sit overnight. Unmold and cut squares the next day. Wrap them in parchment paper or candy foil if they last long enough to be packed up for guests. Helene, these caramels look gorgeous.The way you write about it I feel as if i can make them too. n'est-ce pas qu'ils sont addictifs ces caramels ?!! quant a moi je suis tjs en train de rever sur ton cheesecake, il est prevu pour la semaine prochaine !! Those look absolutely yummy, where are mine?! Dangit!! I'm out of corn syrup but you can bet your bottom dollar that I'll be picking some up tomorrow to make these! They look delicious! Yum, yum, I am so making these. I too am a caramel freak. WOAH! You've got me stuck to this one Helene. I am a sucker for caramel and chocolate combos. I have to try these. You make me almost think I could do this in my kitchen.. maybe I will try to conquer my fears..
That's it helene, you've convinced me, I WILL make these and they WILL turn out! i love caramel, & yours look terrible!! omg i love caramels so much too. i never thought to make them myself now i just happen to have this recipe and some fleur de sel. who am i to ignore the signs!?? These look amazings. I am definitely going to try this recipe out. These look so good - I think I'll have to get over my fear of candy making and try them myself! C'est vraiment delicieuse! Je n'avais pas corn syrup, j'ai mis du miel + mapple syrup au lieu de corn syrup. 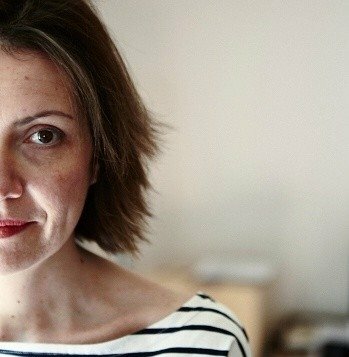 Je devrais diminué la qantitéé du sucre. C'est tout! Mais, tout de meme, c'etait delicieuse.. 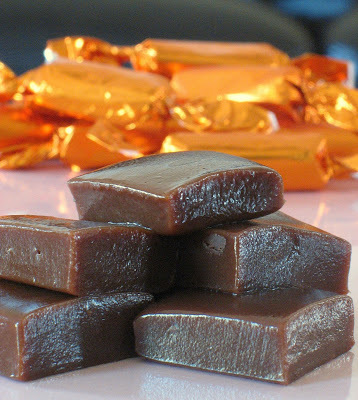 I just now saw your caramels after reading about Lisa's attempts with your recipe, and I am loving the chocolate addition as well, I can see these as a great holiday to try recipe! Helene, what size saucepan do you think you used for the recipe. Also when you use a candy thermometer to you let the bottom sit all the way down to the bottom of the pan? These would be gone within seconds in my house too. They look good and the title...oh my. I can just imagine how good they are! I used your recipe on the weekend and the outcome was just delicious ... though they disappeared so fast ... next time I'll double the recipe (I had hoped to have some left over to try your salted caramel brownies too!! :-( Next time!). The texture was my idea of perfect caramel - not chewy stuck in your teeth type nor gooey soft ... but biteable and chunky! I just found this recipe and I decided to make them to put in the outrageous brownies. however, mine wouldn't set up! They taste great but are still slightly liquid/mushy. Does anyone have any tips? This is the second time this has happened to me.